The summer was very busy and went by extremely fast! We had good turnouts for every event this year. That made for good competition and lots of fun. The second adult camp was a big success. Mary Spini wasn’t able to give her great dressage lessons due to the fact she was flying back from the Olympics during camp. She had a great time in London! The Second Annual Hunt Show was fabulous! Fun courses, good weather and good friends made it even better than last year. The “Find the Fox” contest was especially popular this year and the new outdoor arena fence made it so we had two places to jump in and out of the arena. We can’t wait until next year! The September show and the Halloween show were both very successful. The Halloween show is the final show of the year for the Wildtree series and we added a 3’ Medal this year and the Merlin’s High Jump Class, in memory of Merlin whom we lost earlier this month. 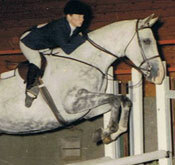 We miss him dearly, he was such a great horse. It seems as if the Wildtree “curse” is finally over for the Halloween Show. The past four years Norma’s students have gone off course, fallen off, refused jumps, circled, you name it in the Mini-Medal Finals. This year everything came together: Amelia Jackson won the Mini-Medal Finals on Four Star, Blair Wilkinson won the 3’ Medal Finals on Four Star and Campbell Patterson and Carola won Merlin’s High Jump topping out at 4’9”. They all rode beautifully this year and Gunny (Four Star) lived up to his name, he was a star. As usual the costume class was very creative and loads of fun. It is amazing how the horses behave so well with all the scary costumes. Amelia Jackson is now going to the University of Portland, Katrina Johns is at Montana State, and Blair Wilkinson is at University of Western States Chiropractic School. We miss them dearly, wish them well and hope to see them often when they have breaks. Amelia and Blair only got to ride a couple of times before their Medal Finals. It is impressive they did so well. Welcome to Brooke Bradshaw from Virginia. She is the new working student for Wildtree Farm. We hope she likes it here. We are trying to get together another John Turner Clinic in the near future. If we can’t get a date with John we may try Nick Karazissis or Kevin Freeman. Contact Norma if you are interested in any of these clinics for the future. We’ll put you on the mailing list.